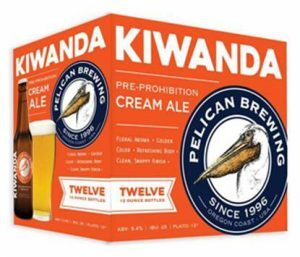 Pacific City, Oregon (November 9, 2016)—Pelican Brewing Company today received a Gold medal for its popular flagship brew Kiwanda Cream Ale in the prestigious European Beer Star competition at BrauBeviale in Nuremberg. The brewery also earned two Bronze medals for its new Beak Breaker Imperial India Pale Ale and MacPelican’s Wee Heavy Ale. With 2,103 beer entries from 44 countries, the competition for one of the most sought-after prizes in the international brewing world received a record number of entries making Pelican’s three notable awards all the more impressive. “This year it has been more difficult than ever to win a medal in the European Beer Star,” says Oliver Dawid, CEO of Private Brauereien Bayern, which has been organizing this competition since 2003. Pelican’s top-selling beer Kiwanda Cream Ale won the Gold medal in the English-style Golden Ale/Summer Ale category, the new Beak Breaker captured bronze for Imperial India Pale Ale as did MacPelican’s Wee Heavy for the Scotch Ale/Wee Heavy category. The competition and medal is the first for Pelican’s recently released Double IPA Beak Breaker. Pelican’s other Bronze achievement is MacPelican’s Wee Heavy the brewery‘s interpretation of the “Wee Heavy” Scotch Ale style—literally a batch of MacPelican’s Scottish Ale brewed with half the water and twice the boiling time to create a beer with a massive malty flavor and a deep red color. The aroma hints of rich caramel, cocoa, toffee and dark fruit, with a full-bodied mouth feel and a velvety sweet, slightly dry finish. Pelican calls it a robust beer with a dangerous, drinkable smoothness. The European Beer Star—the Champions League of beers—enjoys a prestigious international reputation with a strong jury of 124 experts, who assess the beers in a blind tasting according to the same purely sensory criteria as the consumer: color, smell, flavor, aromatic profile and overall impression. This year, the jury included master brewers, beer sommeliers and acknowledged beer connoisseurs from 30 countries. The European Beer Star Award is given to particularly authentic beers with lots of character, which impress the jury in terms of both flavour and quality and which best meet the criteria for the type of beer. Only one gold, one silver and one bronze medal were awarded in each of the 57 different beer categories. The competition is aimed at breweries from around the world which feel committed to the traditional European style of brewing. “The European Beer Star has enabled us to again increase public awareness of the wide variety of great, hand-crafted beers,” says Oliver Dawid. Pelican Brewing Company was founded in 1996 by Jeff Schons and Mary Jones in Pacific City with Oregon’s only oceanfront brewpub. Celebrating its 20th year, the brewing company has created masterpieces like Kiwanda Cream Ale, India Pelican Ale, MacPelican’s Scottish Ale, Tsunami Stout and Doryman’s Dark. With the vision, creativity and brewing expertise of founding brewmaster, Darron Welch, Pelican Brewing has won over 300 awards including the 2014 World Beer Cup© Champion Small Brewing Company and Brewmaster of the Year. Pelican Brewing currently distributes 22oz bottles, 12oz bottles in 6-packs, a new mixed 12-pack, and 50 liter and 20 liter kegs via a network of distributors in Oregon, Washington, Idaho, Nevada, Utah, Hawaii and Vermont. The company operates brewing and brewpub facilities in Pacific City, Tillamook and Cannon Beach.